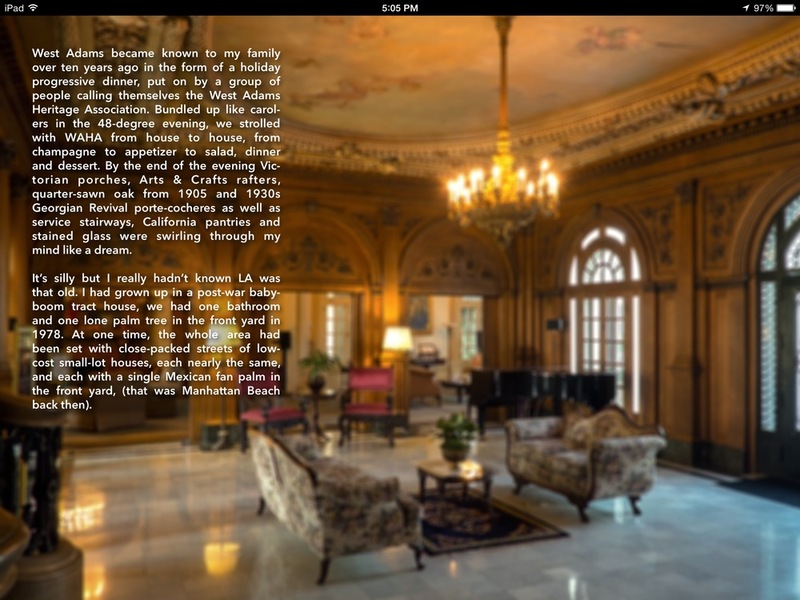 Continuing on from yesterday's post - am putting the whole iPad book online page-by-page. Today we see the Foreword written by Elizabeth Fenner of the West Adams Heritage Association. Behind the text in the book is a selection of photos, blurred to make the text more legible. The homes are, in order, A Craftsman in Victoria Park, the foyer of the Guasti Mansion on Adams Blvd, the Stimson Mansion, interior of the 1912 J.R. Dennison House in West Adams Heights and a Frank Tyler-designed Craftsman being rebuilt in West Adams Heights. Note the button on the last page of the Foreword shaped like the borders of West Adams. Throughout the book whenever you see a button like this you can get additional information about what you're seeing. You'll find the text of Elizabeth's Foreword after the Gallery below. "Looking at these photographs is witnessing the discovery of a neighborhood. It happens all the time in Los Angeles, a city that has long enjoyed being stereotyped, underestimated and misunderstood. Whether this is your first time seeing the houses of West Adams or you’ve known the area for decades, you know the feeling that’s so evident here: wonder, curiosity, and joy that such places and things exist. It is a neighborhood filled with architectural treasures, some of the oldest houses in Los Angeles, and LA’s greatest number of historically recognized landmarks. The miracle that occurred here, the many saved, preserved and restored houses and buildings, is almost exclusively thanks to an organization that was founded only 30 years ago, by a small group of people intent on preserving these houses and these neighborhoods for future generations. West Adams became known to my family over ten years ago in the form of a holiday progressive dinner, put on by a group of people calling themselves the West Adams Heritage Association. Bundled up like carolers in the 48-degree evening, we strolled with WAHA from house to house, from champagne to appetizer to salad, dinner and dessert. By the end of the evening Victorian porches, Arts & Crafts rafters, quarter-sawn oak from 1905 and 1930s Georgian Revival porte-cocheres as well as service stairways, California pantries and stained glass were swirling through my mind like a dream. It’s silly but I really hadn’t known LA was that old. I had grown up in a post-war baby-boom tract house, we had one bathroom and one lone palm tree in the front yard in 1978. At one time, the whole area had been set with close-packed streets of low-cost small-lot houses, each nearly the same, and each with a single Mexican fan palm in the front yard, (that was Manhattan Beach back then). But here, in West Adams, a neighborhood off Crenshaw were grand old homes with glamorous histories and jaw-dropping architectural features. Our tour guides told us about old-growth wood wainscoting, pocket doors and sleeping porches. Each house came with a story, and each story was an epic to rival Gone With the Wind. Really. Changes in population, technology, culture all through the years caused such upheaval in the families and homes, houses, lots, neighborhoods, and boulevards. Gas lighting changed to electric—horses changed to trolleys, then to automobiles. Neighborhoods were built to exclude, then when racial covenants were overturned, the area became a region enjoying great diversity, including many culturally, artistically, and literally rich African Americans. Then the ground literally moved under everyone’s feet when the Santa Monica Freeway was constructed, cutting the neighborhood in half and essentially cutting it down. People with the money to move away typically did, and until WAHA rediscovered and began to rehabilitate it, the area had something like a long sleep. The tours, which were a staple of WAHA identity from the beginning, continue still, and the homes, whether mansions or bungalows, remain fascinating and rich, in construction, culture, and history. Every year uncovers new facets of West Adams history, that run the gamut from oddball to stately, over-the-top to understated, triumph to tragedy. Its residents as well form one of the most diverse populations in Los Angeles, and among its past and present are musicians, actors, singers, artists, movers and shakers in industry, business, education and government. Many will say that it is still a neighborhood in transition, and it is. WAHA and now many other local organizations work together to ensure West Adams and the surrounding neighborhoods preserve the glories of their past lives as well as incorporate the best possible future in urban life: parks, pedestrian friendly streets, easy public transportation. He’s right, there are a hundred different LAs, and West Adams is just one of them, but the people here know it is special. No doubt photographer Jett Loe feels lucky to have discovered West Adams: the buildings, streets, and people of the neighborhoods are a treasure. It’s equally lucky that West Adams has found him."